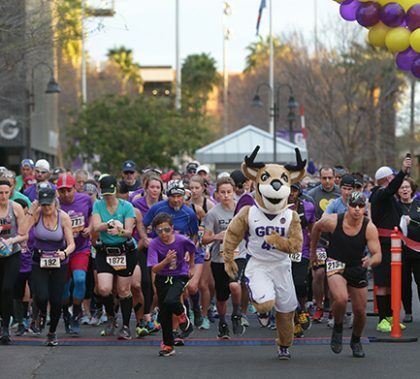 Photos by David Kadlubowski GCU News Bureau More than 2,200 registered runners and walkers gathered on the Grand Canyon University campus for the 2018 Run to Fight Children’s Cancer. The event, the largest race in Arizona dedicated solely to pediatric cancer, featured a 5K and 10K, as well as the backbone of the event, the Cancer Survivors Walk. Run to Fight benefits the Children’s Cancer Network and Phoenix Children’s Hospital. This week’s edition of Antelope intros features a credentials evaluator who loved GCU so much he chose to stay upon graduating. The other is a University development counselor with a passion for health and wellness. Both get a kick out of the outdoors. GCU Today A weekend of GCU outreach events kicked off at the Cartwright Elementary School District’s community garden, where dozens of volunteers gathered with students for a service day of building, learning, tending and planning for the future. GCU News Bureau How many volunteers does it take to sow seeds of purpose? We quickly lost count last weekend but rest assured, no stone was left unturned nor garden untended after GCU made appearances at four outreach events. It started at the Cartwright Community Garden and wrapped up with GCU Men’s Soccer, Cheer and the big guy himself, Thunder, making their annual appearance at the Arizonans for Children Foster Festival at Enchanted Island Amusement Park, where kicking goals is more than just fun, it’s a peek at opportunities for higher education. When being interviewed for a mentor through AFC, and asked where they are going to college, more than 90 percent of foster children answered GCU. Future Lopes, indeed. GCU News Bureau Nearly 300 volunteers from Habitat for Humanity and Grand Canyon University spread their love and spirit at Alfred F. Garcia Elementary, one of the state’s most impoverished schools. The volunteers woke up early on a Saturday to shovel mounds of sand into two playground areas, paint the exterior wall of the school, turn the outdoor basketball, four-square and hopscotch squares into splendors of color, and even refill by hand the faded school emblem at the school’s entrance with fresh color.